If we add a foreign key column in our migration file in function up(), we need to make sure that foreign key would be dropped in down() function, right? The thing is that you need to remember longer foreign key name to drop it by name. What official Laravel documentation doesn’t say is that there’s a more convenient way. 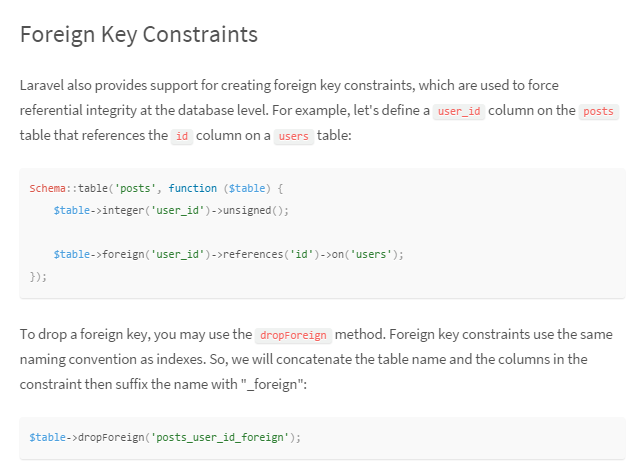 Let’s take a look at official Laravel documentation and what it says about foreign keys. As you can see, we are dropping foreign key with dropForeign() function and parameter which has this format: [table]_[column]_foreign. But there is another way to drop foreign key – just by the name of the field, you just have to put it as array parameter. So, not everything is in the official documentation, sometimes dig deeper! Good one 🙂 Always easier to just use foreign key name which you can easily look up at your migration file, instead of needing to provide table name and “foreign” string at the end as well. This was perfect for me, since I noticed $table->dropForeign(‘posts_user_id_foreign’); ignores the prefix in the env. My new video show “Laravel Business”! Episode 01: Why Laravel?